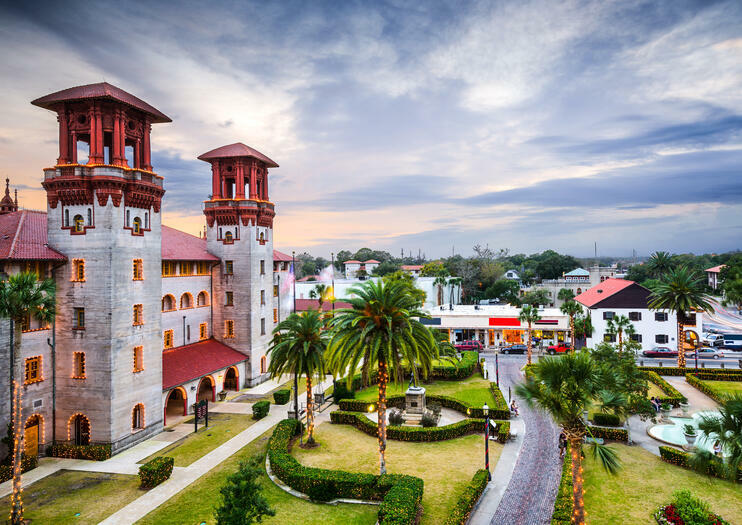 St. Augustine holds the title of “America’s Oldest City,” and its historic downtown district arguably holds more history than any other in the United States. Founded by Don Pedro Menendez de Aviles of Spain in 1565, St. Augustine is the oldest continuously-inhabited city in America that was settled first by Europeans. The multicultural city has centuries of stories built into its streets and walls. A stroll through the downtown unfolds influence by the Spanish and English, as well as Native Americans, African Americans, and even Greeks. The heart of the area is St George’s Street, a pedestrian-only promenade lined with historic architecture and specialty shops, galleries, and restaurants. Parts of the historic downtown have been preserved as living museums, some with artifacts dating back to the 1500s. Don’t miss the “Fountain of Youth,” a monument dedicated to Juan Ponce de Leon (who claimed Florida for Spain in 1513.) The old schoolhouse, old jail, colonial Spanish Quarter, and Castillo de San Marcos all offer a glimpse into the past. Downtown St Augustine is pedestrian-friendly and most of the historic sights can be seen on foot. Many of the streets are narrow and designed for foot traffic as opposed to cars, so parking in the historic area itself can be a challenge — though some public lots are available. As the oldest city of European origin in the United States, St. Augustine harbors a fascinating history haunted by the restless souls of its former residents. On this 1.5-hour ghost tour, you’ll follow a master storyteller to sites of reputed haunting: see historic landmarks such as Hugenot and Tolomato Cemetery, and discover traumatic tales from St. Augustine’s 450-year history. This small-group tour is limited to 15 people to maintain the correct atmosphere. Experience the beauty of a St. Augustine sunset from the air on this guided helicopter tour. Depart to the east of the oldest city in America at dusk, then fly south over 12 miles of beach before returning just in time to enjoy a spectacular view of the sun as it sets over the historic downtown district. It’s a sight for romantic eyes — an unforgettable, bird’s eye view of St. Augustine and a perfect way to propose or celebrate an anniversary or honeymoon. Experience the beauty of historic St. Augustine Beach and the Old Downtown region from the air on this guided helicopter tour. Fly above part of the Intracoastal Waterway and enjoy a breathtaking view of the coastline, including Usina Bridge, Porpoise Point, Anastasia State Park and the St. Augustine Light Station on the way to St. Augustine Beach. Then take in the panoramic view of the nation’s oldest city, St. Augustine, to conclude this scenic 32-mile adventure.